Killer Covers: Two-fer Tuesdays: Well, Which One Is It? Two-fer Tuesdays: Well, Which One Is It? She Shall Have Murder (1948) introduced amateur sleuth Dagobert Brown, described as something of a black sheep born into a titled English family, and his partner (later spouse) Jane Hamish, a secretary and writer. They went on to star in 11 more lightweight but reportedly pleasant mysteries, concluding with 1959’s Lucky Jane. Nobody Wore Black was the fourth installment in Ames’s series, first published in 1950 under the title Death of a Fellow Traveler. 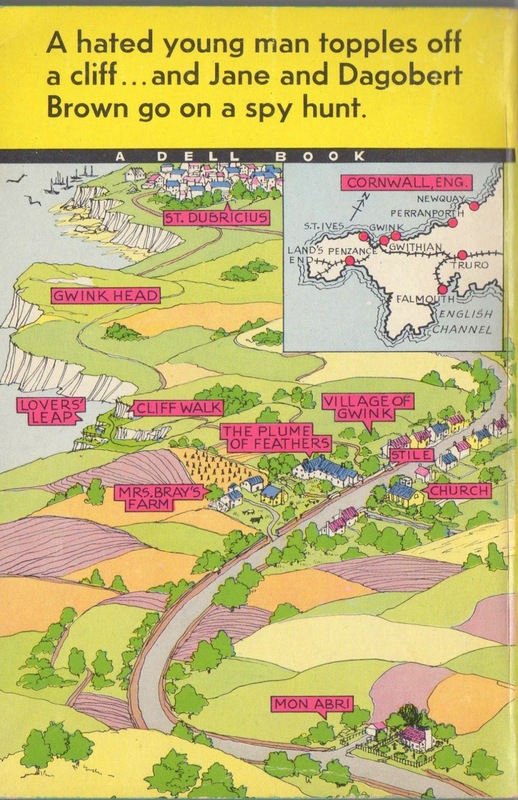 The edition shown above and on the left was released in 1952 by Dell Books, with cover art by Robert Stanley. 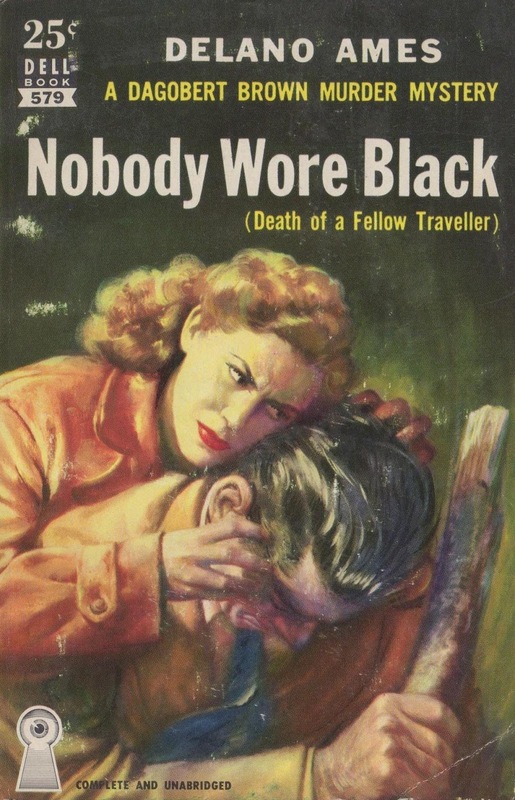 (Left) "Mapback cover" of Nobody Wore Black. Click for an enlargement. Publisher Rue Morgue Press explains that, unlike some husband-and-wife detecting teams, “the Browns were pretty much intellectual equals and if Jane rushed into places no smart woman would go … well, she knew that, thank you, but someone had to do it. And, besides, why should Dagobert get to have all the fun?” In Nobody Wore Black, Dagobert (what a moniker!) encourages his ever-lovin’ to pen another new thriller novel to keep their financial house from collapsing. The project sends them off to “windswept Cornwall,” England, as critic Yvette Banek writes in this blog post. And what’s the crime to which this pair will inevitably turn their imaginations? Questions that plague: Why is the victim’s sister so oddly nervous? Why is her devoted hubby so calm? Come to think of it, explain this marriage please. And oh by the way, why is that beautiful young actress (travelling with her director and filming a few scenes for her latest movie along the way) so obviously unsettled? Why is the voluptuous proprietor of the pub so skittish? Why is her lout of a boyfriend (a local farmer) so jealous? Why is his frowzy mother so talkative? And what about those two obstreperous harlequin Great Danes? This time out Dagobert faces a definite moral quandary and just when he thinks he’s found the way out, turns out, he hasn’t. Banek, a onetime January Magazine contributor, has also reviewed four other Jane and Dagobert Brown mysteries here. 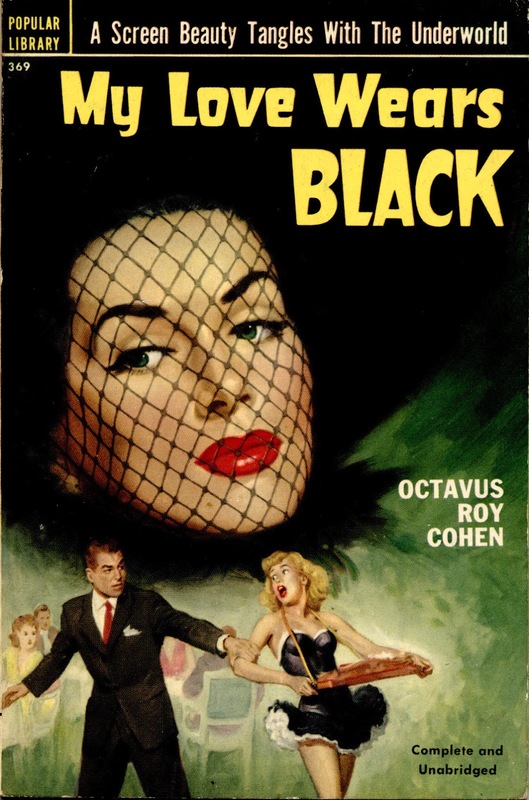 Now let’s turn our attention to this week’s other cover, from the 1951 Popular Library edition of My Love Wears Black, penned by South Carolina-born journalist-turned-laywer-turned-author Octavus Roy Cohen (1891-1959). It’s not one of Cohen’s better-known books starring corpulent, fish-eyed Jim Hanvey, who’s described by The Thrilling Detective Web Site as “an intriguing combination of Jed Clampett and Sam Spade, part-conman, and full-time good ol’ boy.” Instead, My Love Wears Black--which was originally published by Macmillan in 1948--gives us a police protagonist, Lieutenant Marty Walsh, in a yarn that Kirkus Reviews described as “a suave, sophisticated Hollywood murder with lots of drinking, love and sleuthing, as a real-estate agent and his actress girlfriend … get caught up in a homicide case that points straight at them.” Walsh went on to lead at least two more Cohen novels, More Beautiful Than Murder (1948) and A Bullet for My Love (1950). Regrettably, the lovely, mysterious illustration decorating the façade of My Love Wears Black is uncredited.